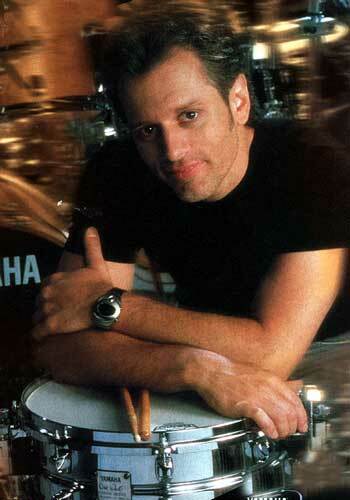 Born in 1960 in St. Louis, Missouri, Dave Weckl is one of the most virtuosic drummers from the fusion of 1980-90. He is one of the first to introduce the bass drum double pedal in jazz and achieve instructional videos ("Back to basics" (1988) and "The Next Step" unavoidable). His collaboration with Chick Corea remained in the annals ("Akoustic Band", Grammy Award 1989). His speed in heel-toe playing and the complexity and speed of his three limbs roll ("Linear Drumming") have, to my knowledge, never been exceeded. 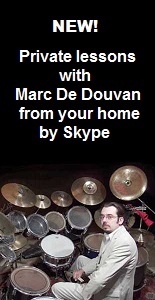 He studied the best drummers and teachers of the 1970s in all styles (Steve Gadd, David Garibaldi, Peter Erskine, Gary Chester, Harvey Mason, Carmine Appice, Jack DeJohnette, Elvin Jones, ...). He is a great promoter of the one-handed roll technique by alternating strokes and strokes dissociation ("Moeller technique", named after the first teacher to describe it in writing). His sense of melody, nuances (dynamics) and rhythmic shift, are remarkable. Dave Weckl had the honor of playing in the first concert of tribute to Buddy Rich (1989) with Steve Gadd and Vinnie Colaiuta as acolytes (their improvised drumset trio is a great moment in the history of the drumset). Dave has recently included bongos and djembe in his set and achieved new educational DVD.